We bring forth our clients a qualitative range of Eccentric Slotter Machine. 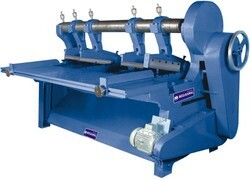 This machine is used for punching out slots and to stitch the edges in the corrugated sheets. The Eccentric Slotter Machine that we offer is operated manually and is capable of slotting a number of sheets at one time. We have also provided the option to adjust the distance between the two slots, the slot depth and the side gauges. Moreover, this machine can slot and Corner cut the Corrugated Board simultaneously. The machine is provided with three slotting & one corner cutting head and gauges are provided for accurate feeding of sheets. We offer heavy duty eccentric slotter machine which is used to push out slots and stitching edge in the corrugated sheets. This machine is manually operated and capable of slotting a number of sheets at a time .The distance between two slots, slots depth and the side gauges as well as the gap between lower knives are adjustable. 75" 17" 3.0 2100 100"x56"
85" 17" 5.0 2300 110"x56"
95" 17" 5.0 2600 120"x70"
105" 21" 7.5 3000 130"x80"